Mobile forms help companies streamline their data collection and present a way for companies to fill and submit traditional paper forms like reports, audits, or inspections on mobile devices. They're also easy to use and set up. Here's how to quickly get started with using mobile forms for your business. When work frequently takes you to projects in rural locations without a reliable cell or Internet connection, the offline capability of a mobile forms app allows users to collect data in real-time, regardless of where a jobsite is located. Another common way to use mobile forms is for employees filling out checklists, inspection forms, maintenance requests, or any other unique, custom forms. It's easy to take the current paper-based versions of these forms and turn them into forms that can be completed on mobile devices. A flexible form builder makes collecting any type of data from the field possible, from standard yes/no questions and select questions, to more advanced fields. Mobile forms make it possible for drivers to complete required paperwork, including any necessary photos, GPS and time-stamping data, and send it back to the office instantly. This gives the office a real-time understanding of the status of the haul, vehicle, and driver and keeps clients better informed of progress at every stage of transport and delivery. According to a recent survey, an immediate benefit to implementing mobile forms is lowering operational costs. Your company may be stuck in a traditional way of doing things, with field techs or representatives filling out paper forms on the road and data being manually entered into an Excel sheet. This method of collecting data might have worked in the past, but it also takes more time than it really should and is an inefficient way to operate. Manual data entry can be a major waste of time every day, while also leaving room for human error. Mobile forms eliminate this wasted time by taking out the extra step and getting you access to data quicker. Paperwork, reports and forms are filled out within the mobile forms app and delivered right to your current system, so no additional entry is required and you can access the data right away. You'll also save administrative hours and time in the field. For example, think about how often time is lost between getting the report from a service call and when you are able to process the ticket and send an invoice to the customer for service. Using mobile forms to complete the service report in real-time makes a difference in your ability to turn projects around. To get the most value out of mobile forms, they have to be designed to collect the data you want and need. 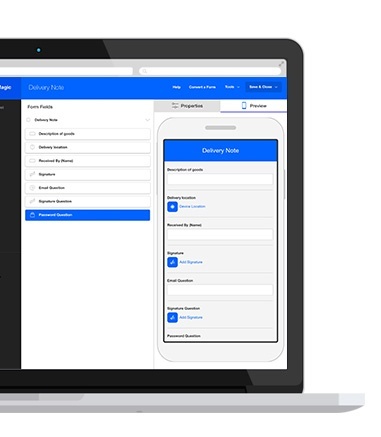 Device Magic's form builder makes it simple to collect all pertinent field data. With required fields, calculated questions, and conditional statements, you can be sure your team is capturing everything they need to be, without having to click or scroll forever. The mobile app and form builder allow for numerous types of fields for data collection. Both basic and complex forms are easy to create with our form builder. Customization allows for you to build forms with standard fields like yes/no questions, select questions, signatures, and photos or more advanced fields to create workflows within your forms. 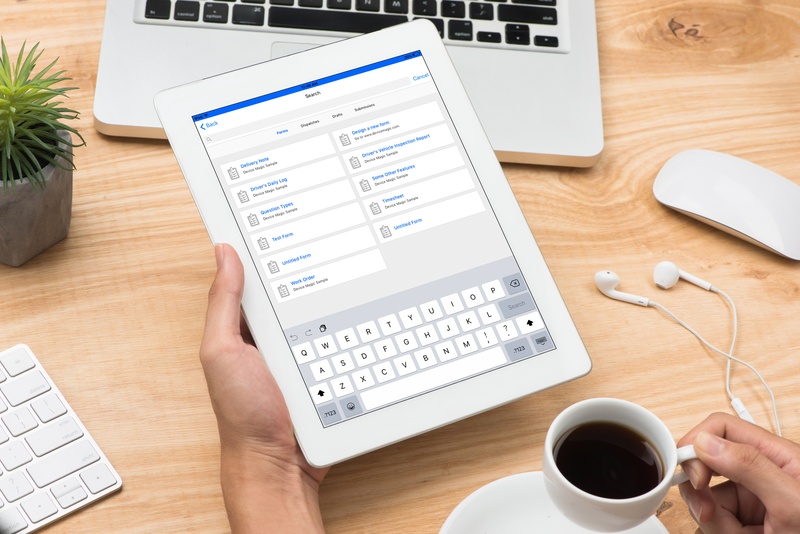 Our mobile forms solution integrates with your other business tools and systems to enhance existing workflows. Submitting a single form can trigger an automation sequence, such as sending data to a manager’s email, delivering photos to Dropbox or Google Drive, saving a copy of the form to your project management database, or any other number of actions. Calculated questions, Rules, and Expressions are incredibly valuable features to leverage when building your form. This is where you can begin to create the “smart” aspect of your form by calculating the difference between two answers, narrowing down results for easier selection, and even including validation rules. There’s no limit to the number of form Destinations you can set up within your Device Magic account. It's important that you're able to get your data in the format you need and sent where you need. One popular Destination option is the PDF format. With this Destination, you have complete control of the PDF output of your forms. You can create and upload a template with the customized question order, image size, your organization’s branding, and even font size and color. This allows you to recreate a digital version of a form that matches your original paper form, and can easily be added to your digital documentation systems and records without the need to scan and save a printed form. Destinations make it easy to automate your workflows, and submitting a single form can kick off an automated sequence. Deliver photos to your Dropbox account, push a text message to a supervisor, and email an invoice to a customer, all by hitting “Submit” on one form. Processes that used to take days to complete can be reduced to minutes with mobile forms automation. Collecting data from the field is only the first step. Analytics takes your data a step further by providing actionable insight from your form submission data. This way you can monitor functions that are critical to your business, track progress over time, and see the full picture of what is happening across the organization. 1. Is there a limit to the number of forms you can build? No, there are no restrictions on the number of forms you can build or how many submissions you can have with Device Magic's mobile forms solution. 2. What devices are compatible with Device Magic? 3. Do you have the ability to segment forms by crews/departments to avoid confusion? Yes, you can create user groups to segment your teams and control who has access to which forms in their mobile forms app. The account administrator can determine permissions and access for each user on the account. Once you create a form on your account, you can share it across all of the devices associated with your account. Or, you can make the form available for only the specific devices or users you choose. 4. Is the licensing based on users or devices? Licensing is available on a per device per month plan. You can find more information about our plans here. 5. Can you pre-populate multiple forms using the Dispatch feature? Dispatch lets you send forms with pre-populated data to notify employees in the field or on the road of new tasks. You can send one partially completed form to one person or multiple connected devices. The form can include key information such as the job site, a description of the task and the customer name. After your tech completes the job, they finish filling out the form and submit it. 6. How can I connect devices to my organization in Device Magic? 7. Mobile forms work offline, but what happens to data if you don’t have a connection? If we missed your question during the webinar, feel free to ask it in a comment below. Ready to improve your data collection process? Try mobile forms for free.